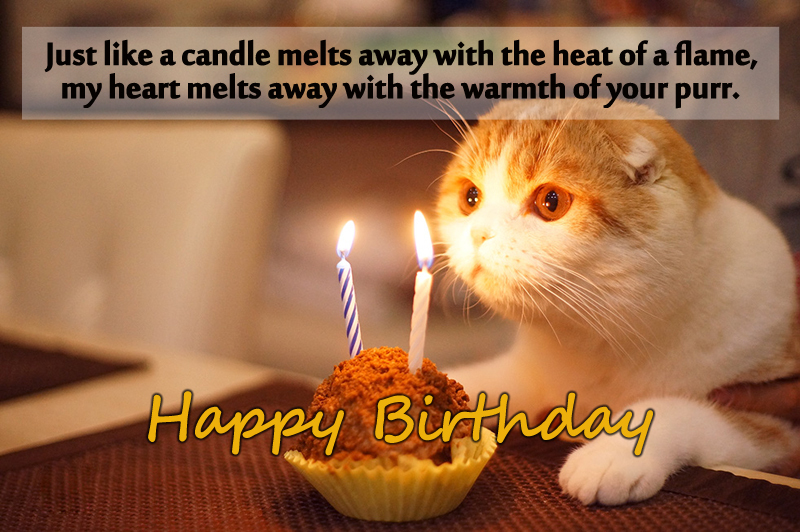 Birthday Wishes for Cat : Cats are most adorable and funny creature also they are too good as a favorite pet. Is your cat going to add another loving year or celebrate its birthday? 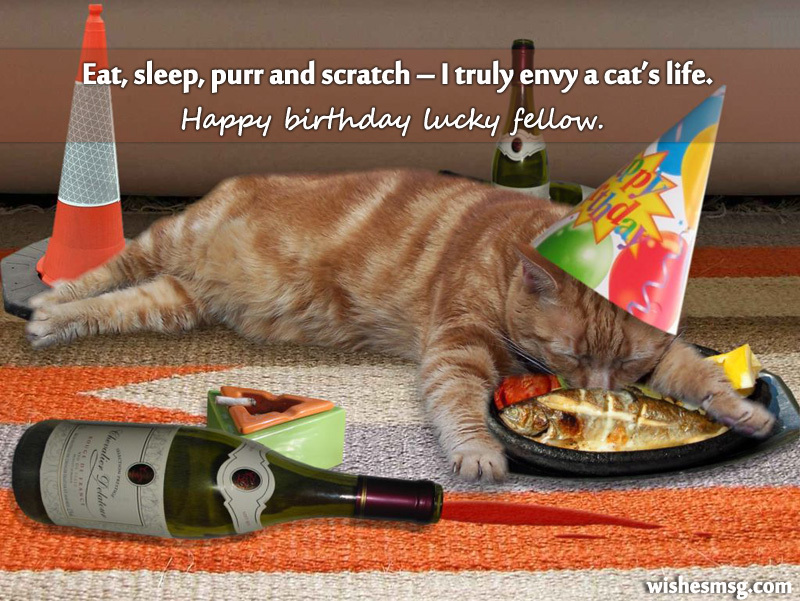 Whatever it seems silly now but a dear pet like cat deserves a little observance like this moment of it’s birthday. 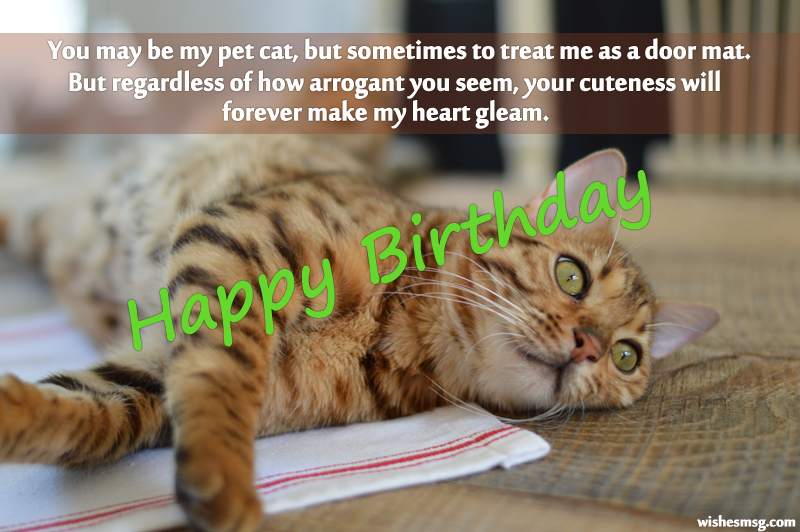 Celebrate your pet cats birthday with these best birthday wishes for cat though they can’t read but it will be a way to make memories. So, give a treat to your loving cat on its birthday with its favorite food, toys and taking many pictures to keep memory for future. 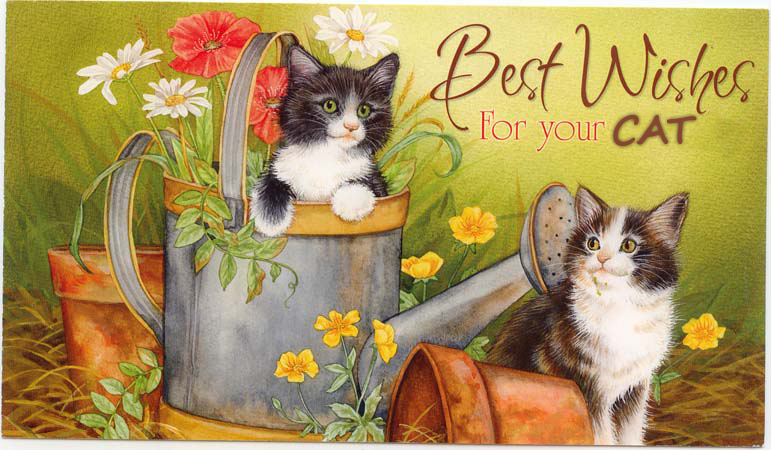 Best Birthday Wishes For Cat To Celebrate Cute kitty’s birthday. 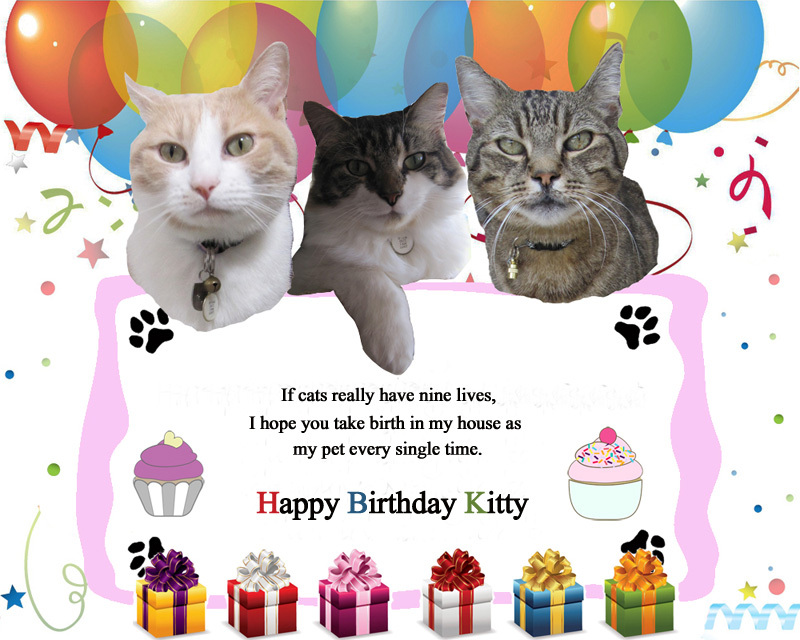 Make you kitty’s birthday more funny and memorable by the listed sweet birthday wishes for cat. Really you will get so much fun with these wishes. You have taken over my armchair, sofa, bookshelf, comforter, laptop and the most important of all – my heart. Happy birthday to my cuddly cat. If I posted videos of your cute antics on YouTube, they would go viral because you are the cutest cat in the whole world. Happy birthday. The only reason I couldn’t buy you a birthday gift is that you have been sleeping on my damn purse the whole day. Happy birthday cat. I got you a gift on your birthday. Will you be kind enough to get into the mood of opening it? Happy birthday kitty. Whoever says that a woman’s mood swings are unpredictable, has obviously never had a pet cat. Your mood swings my dear kitty, are off the hook – but I still love you. Happy birthday. Happy birthday to the most adorable member of this household who is the definition of the word CUTE. Happy birthday. Your meows make me weak in the knees, your purrs give my heart a tender squeeze. The cute feline that you are, make you my life’s star. Happy birthday. My best friend is extremely photogenic, graceful, stylish, independent and self-centered. She is not a supermodel, she is my loving cat. Happy birthday sweetie. I don’t care about myths which say that black cats bring bad luck. All I know is that you bring happiness in my life. Happy birthday cutie. I think you secretly know how cute you really are, and you take advantage of your cuteness all the time. Happy birthday cute kitty. My boyfriend is jealous of you because I love allowing you to lick me, curl up in bed with me and play with me till no end. Even he does not get some of these privileges. Happy birthday kitty. You have occupied my heart, which I liked. But you have also occupied my bed, for which I didn’t have a choice. Happy birthday. 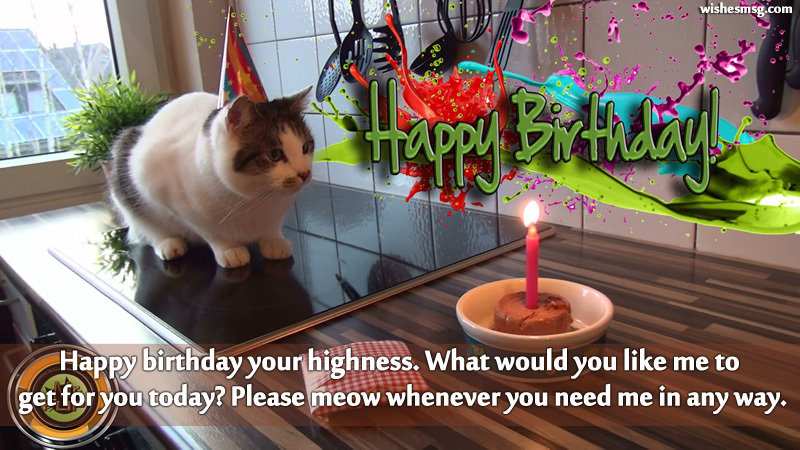 Hey cat, on your birthday I want you to know that you are my idol. I wish I could sleep, eat, roam about and be loved whenever I wished without having to be nice to anyone. Happy birthday. As of your master, I have finally got used to the fact that I am not actually your master. Happy birthday kitty. I know you hardly care whether you have turned two, ten or fifteen as long as your food bowl is kept full and your litter box is kept empty. But here’s wishing you happy birthday anyway. You have no idea how powerful your purr is. I adopted you because my heart melted when you purred and it changed my life forever. Happy birthday. I think you must have been a magician in one of your previous cat lives. Your meow is like a magic wand which you conveniently wave to order food and affection. Happy birthday. No medicine in the world has the power to heal heartbreak and soothe away the tension from my life like the purr of my cat. Happy birthday baby. If cats really have nine lives, I hope you take birth in my house as my pet every single time. Happy birthday. Even though you tear my cushions and rip apart my books – I have no choice but to love you because of your cute looks. Happy birthday kitty. When I got you, I thought I was getting a pet cat. But as time has gone by I have obviously realized that I got myself a master. Happy birthday sir. You demand food by meowing loudly but no one can ever demand your attention. You demand a cozy place to take a nap but no one can ever demand to play with you. 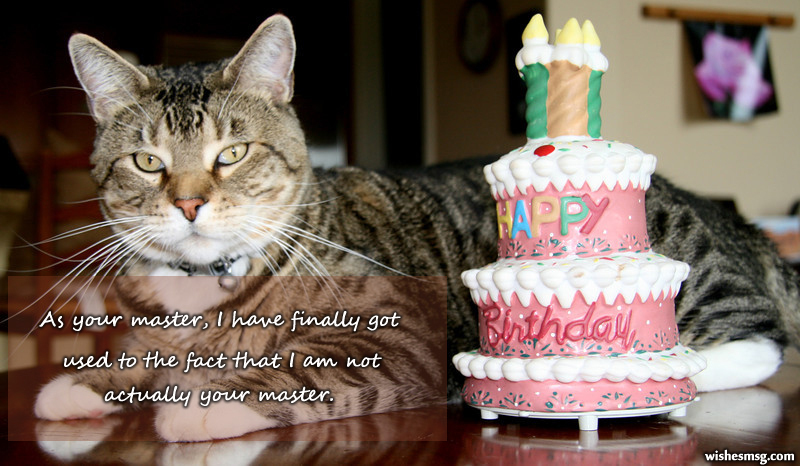 Happy birthday to the cat who is truly his own master. You may be my pet cat, but sometimes to treat me as a doormat. But regardless of how arrogant you seem, your cuteness will forever make my heart gleam. Happy birthday. There is not a single person in the whole world who can make me break into a smile even in the middle of tears, except you. Happy birthday to my cute cat. Staring at your cute little face, listening to your meows and rubbing you on your head puts me in a happy face called heaven. Happy birthday kitty. I put cat flaps on all the doors of my house when I got you, so that you could easily enter all the rooms. Little did I know that you would easily enter the hearts of everyone in the family. Happy birthday. I am proud to have discovered the cure for anxiety and stress. It is you, my pretty kitty – I love you in excess. Happy birthday. All the dog owners in the neighborhood are jealous of me because I have a cat as cute as you. Happy birthday. You are not just my pet, you are my life’s healing balm. When problems crop up from left, right and center, your cute purrs make everything seem calm. Happy birthday. Happy birthday your highness. What would you like me to get for you today? Please meow whenever you need me in any way. If your cute meows didn’t melt my heart, I wouldn’t have tolerated your arrogant ways from the start. Happy birthday. You don’t know any tricks, you don’t jump in excitement when I come back from work and you ignore me most of the time. I still don’t know why I love you so much. Happy birthday kitty. There is only one way to describe your paws, your pointy ears, your fluffy tail and your adorable meow – cuteness unlimited. Happy birthday cutie pie. Eat, sleep, purr and scratch – I truly envy a cat’s life. Happy birthday lucky fellow. I don’t know whether I am wishing happy birthday to my master or my pet. Happy birthday kitty. Just like a candle melts away with the heat of a flame, my heart melts away with the warmth of your purr. Happy birthday little one. 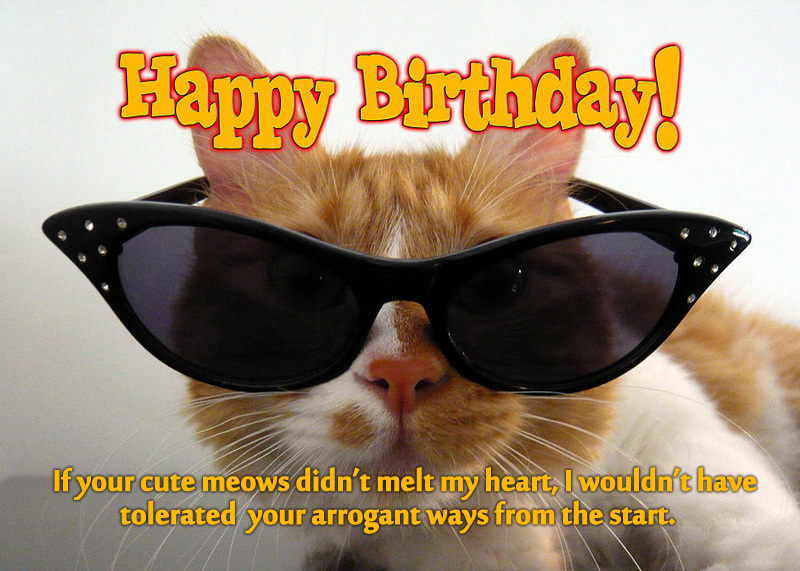 Happy birthday to my cat whose name spells out as CAT – Cute Adorable and Tender. Sometimes you claw me, sometimes you purr in my lap. Sometimes you ignore me, sometimes you take a nap. Whatever you do, I just want you to know – that my love for you will forever grow. Happy birthday. Nine lives of purring, eating and napping make you the luckiest fella ever. Happy birthday. You never play with me when I want you to and you ignore me when I need you the most. You scratch me when I am most vulnerable and when I want to cuddle, you behave like a ghost. You wake me up with your meows when I am in a deep slumber. Even when you tear the upholstery, there is never an ounce of sadness on your face for your blunder. Still, I love you more than anything else in this world – because it is a heart-warming sight to see you on the sofa curled. Happy birthday. We feel glad if you find satisfaction with these best birthday wishes for cat and let the wishes to be a great source of enjoyment.